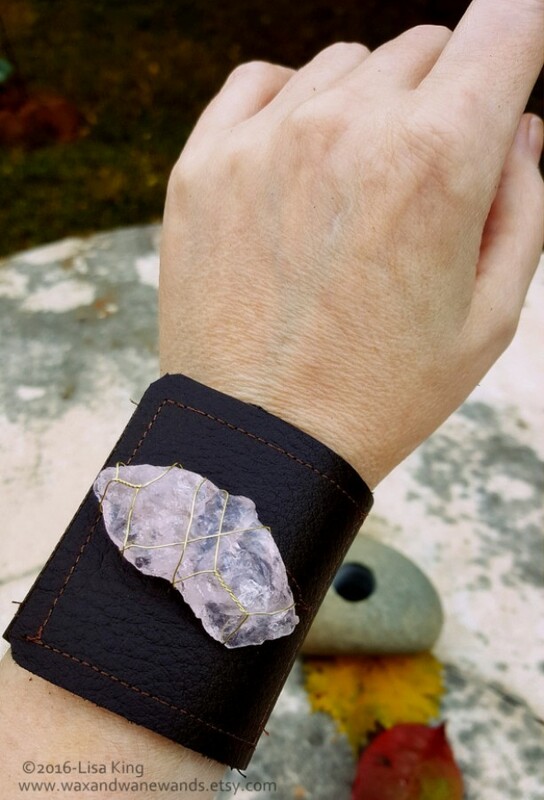 This listing is for a handmade leather cuff, with a rose quartz raw crystal accent. 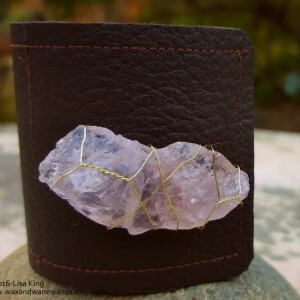 The crystal is hand wrapped with brass wire. The Chocolate Brown leather is either upcycled or sustainable, from my local Native American Pow-wow. It is backed with soft suede. 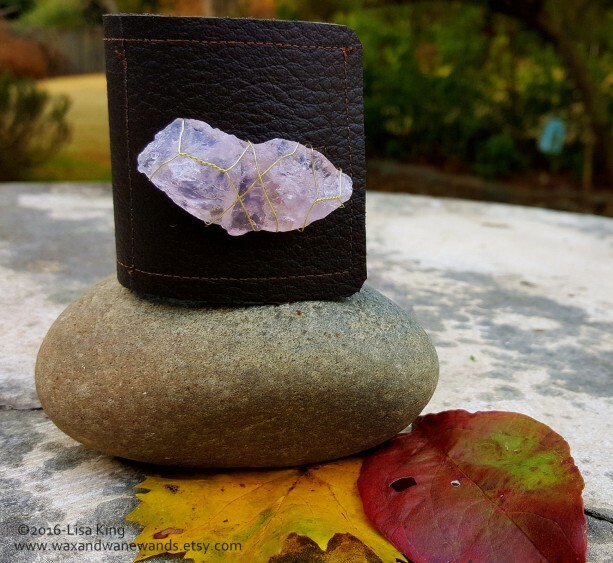 The crystal is of excellent quality, pale pink rose quartz, and from a local gemstone shop. (Please note, each crystal will be slightly unique in color and shape. This particular bracelet may or may not be in stock. Each cuff is uniquely made to order.) 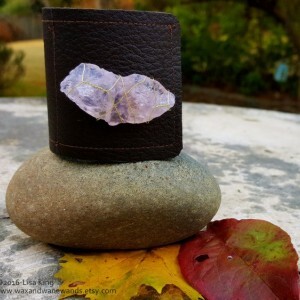 The cuff has a buttonhole closure, and the crystal or stone serves at the "button". 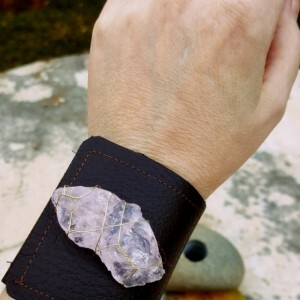 This is a One Size Fits All standard Ladies cuff, and it is 2.25 inches tall, and 8.5 inches long. It will fit an average Ladies wrist of 6.5 to 7 inches around. Technically, all my cuffs are Unisex, and any cuff will look lovely on every human! I have only listed Ladies and Mens cuffs for sizing convenience. There is a small amount of leeway, as the crystals are affixed using black elastic, so that there is a bit of give or play in the size. You can adjust the cuff about a half inch, by tightening where the crystal goes through the buttonhole, or it can stretch out a bit, at the very edge of the button hole, with the elastic in play. 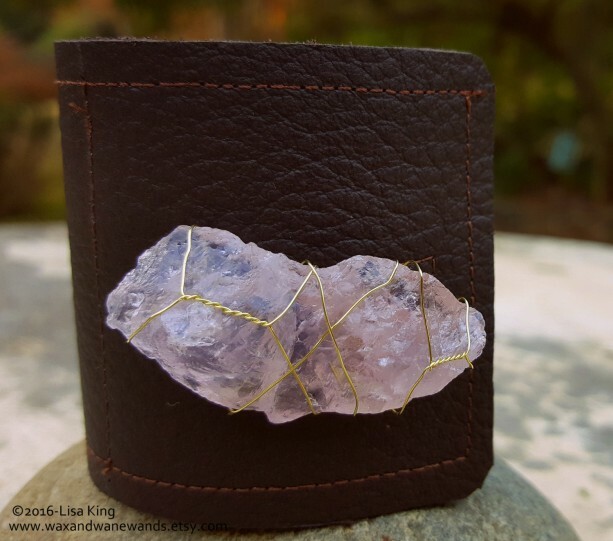 Properties of Rose Quartz: Lowering stress and tension in the heart, Rose Quartz clears out anger, jealousy, and resentment of others, and allows healing of heart issues and disease associated with holding on to such negative emotions. Known as a romance stone, Rose Quartz can be used to attract love. Some nuts and bolts: CUSTOM SIZING: If you are unsure if this will fit your wrist, take a piece of string, and loosely wrap in around your wrist at the wrist bone. 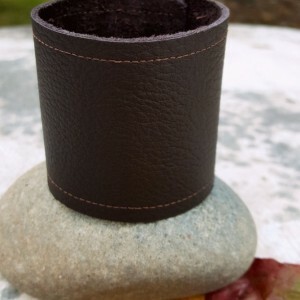 If your wrist measures just under 6.5 inches, up to 7.25 inches, this cuff should fit. If you are still very unsure, you can send your wrist measurement to me via Etsy Messaging, and I can confirm the fit. MENS SIZES: Cuffs in 7, 7.5-8.5 inches will be available in other listings. Again, measure your wrist with a string across the wrist bone. 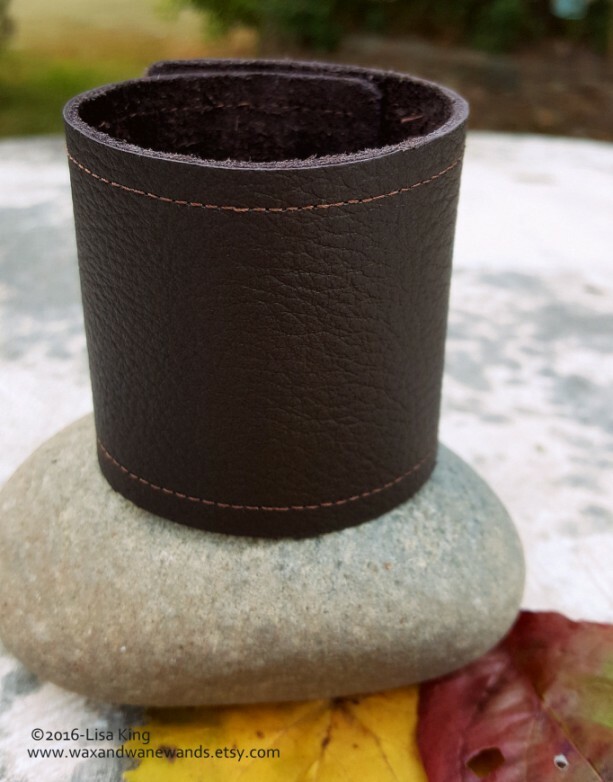 If your wrist is just under 6.5 inches, up to 7.25 inches, this cuff should fit you. Technically, all my cuffs are Unisex, and any cuff will look lovely on every human! I have only listed Ladies and Mens cuffs for sizing convenience. 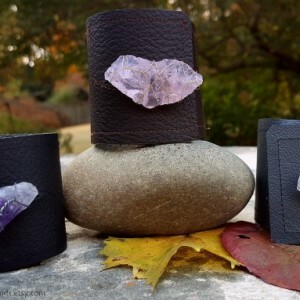 CHILDRENS SIZES: I can make just about any cuff smaller, before shipping, by moving the crystal "button" in tighter, and trimming the cuff. If you'd like to order a child's size, or a cuff smaller than 6.5 to 7 inches, just message me prior to your order, and I can confirm the sizing. Take a piece of string, and loosely wrap in around your wrist at the wrist bone to take a measurement. Please be gentle with the crystal wire wrapping, and putting your crystal through the buttonhole. These bracelets are handmade, as sturdy as can be, but they are not machine made. Any violent tugging on the crystal or the leather may result in damage. I do not offer repair services for any damaged bracelets. PLEASE BE SURE THAT YOU HAVE MEASURED YOUR WRIST SIZE, BEFORE YOU ORDER! YOU CAN CHECK WITH ME VIA ETSY MESSAGING, IF YOU ARE UNSURE OF THE FIT! 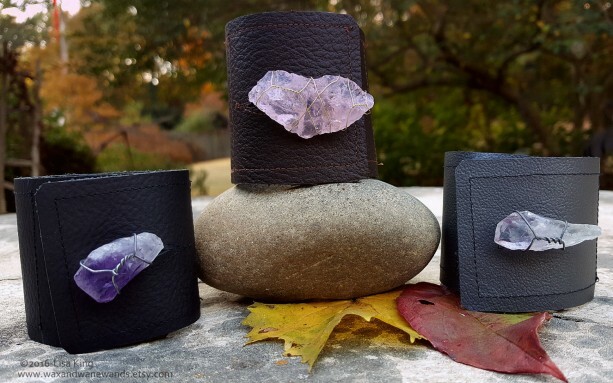 EACH CUFF IS UNIQUE, AND RETURNS WILL ONLY BE ACCEPTED WITHIN A FEW DAYS OF YOUR PURCHASE. PLEASE SEE MY SHOP POLICIES FOR RETURN INFORMATION. DAMAGED OR WORN MERCHANDISE MAY NOT BE RETURNED. ANY RETURN SHIPPING FEES WILL BE PAID FOR BY THE BUYER, AND THE RESPONSIBILITY OF THE BUYER.